Over the years, Evangelical Alliance for Preacher Training/Commission (EAPTC) has grown to be a non-denominational, faith-based international organization. 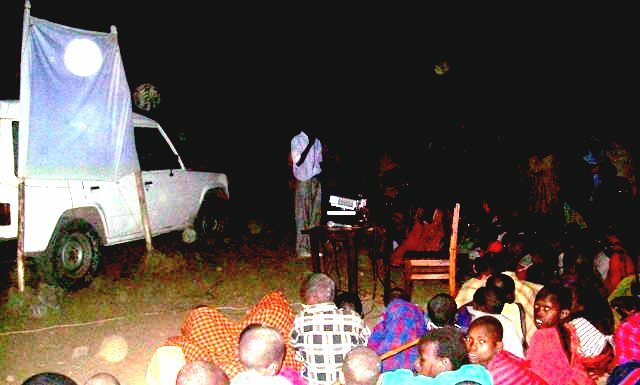 Triggered by my missionary commission to Africa, it was founded by a group of mission-minded church leaders in 1996 to assist indigenous churches in meeting the spiritual and physical needs of people in their communities. 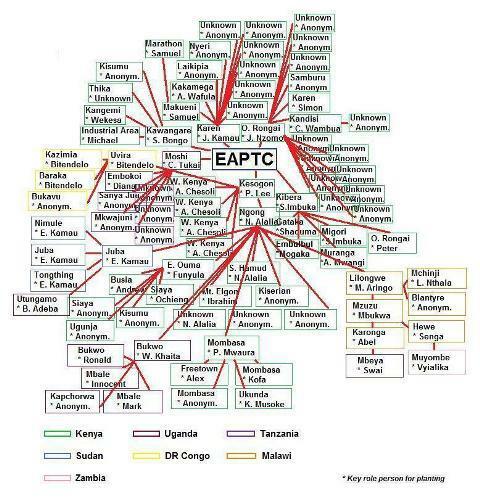 Therefore, EAPTC’s strategy has been to build a working relationship with the local churches and church leaders in the nations of Africa and beyond. By empowering indigenous leaders, we believed we could build relationships with the local churches to create a lasting foundation for sharing the gospel and to bring a positive social change to manifest God’s kingdom on earth. 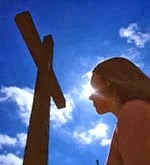 EAPTC mission has been expanding through its unique multiplication methodology of cross-cultural discipleship. If you have not had a chance to see the chart of EAPTC-Africa’s multiplicative growth, here it is. 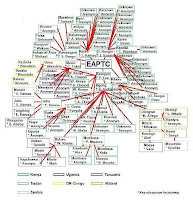 This multiplication family tree of EAPTC-Africa was originally drawn out by Pastor Hamon Kim who visited Africa with us 6 times in past, and it was later modified into a handy format. It shows how God has been blessing the work for years through the biblical multiplication of discipleship and church planting. On the top of major axes of leadership training, church planting, and children ministry, EAPTC presently operates additional ministries like film evangelism, nursery schools, literature production, microfinance banking projects, radio broadcasts and orphanage in some countries where it works. Nursery school in Lilongwe, Malawi is gaining the confidence of the community with its low-cost quality education for local children. They had a Parents Day on June 29 and witnessed many parents’ appreciation regarding their work with over 30 children. 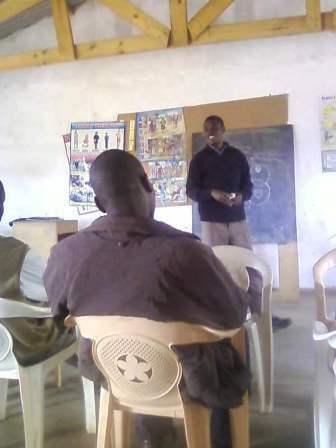 Thanks to your prayers that an exciting addition of sharpened gospel workers has been made to God’s army on August 5 through Lilongwe Bible school graduation. Our congratulations and best wishes to those graduates and lecturers who worked hard to make that day possible! We had another joyous occasion of p worked hard to make this day possibleastoral ordination in Funyula, Kenya on August 18. Revs. Cletus Tukai and Nicholas Alalia presided over this event. We thank God for continuous move of the Holy Spirit in Africa through our faithful indigenous leaders who are making Africa a better place even this day. I’ll be in Washington DC area from September 29 to October 11 to meet and to minister to a number of ministry friends and supporting churches. If you’re in the area, I look forward to seeing you there. If you’re still not connected with us through Social Networking Service (SNS), kindly do so. We’re trying to update missions news to our friends and supporters through SNS as well. That way, you’d not miss any of important missions updates as we keep standing together for the souls of Africa and beyond!